This is my favorite 'Game of Thrones' autotune from @musicalscience, appropriately titled, 'The Dragon's Daughter.' It has all of your favorite characters singing their little hearts out. Yay. It actually has a cool little beat to it. I've also enjoyed the 'Game of Thrones' and 'House of Cards' mashup. This guy's impression of Frank Underwood is spot on. Batman turned 75 yesterday, which means he looks pretty good for someone who is almost an Octogenarian. I've always said that Batman is the guy you date. Superman is the guy you marry. So here's to you Batman. Happy Birthday. So supposedly I've turned into a bitter Wonder Woman fan because I don't understand why every male superhero under the sun is getting their own film or television series. You can see a full list of all of the new potential superhero films and series here. I've also started to keep tally of all of the reasons (excuses) we still don't have a Wonder Woman film or series yet. Listed below are my favorites. 1. Wonder Woman is just too epic for television. So Superman isn't too epic, but Wonder Woman is? Superman is the definition of epic. 2. Wonder Woman doesn't have the brand recognition that Superman and Batman have. So 'The Arrow,' 'The Flash,' and now Jim Gordon ('Gotham' series) (I limit this to DC Comics) have more brand recognition than Wonder Woman? I don't think so. 3. 'Arrow' has done so well because there was a substantial change to the titular character. The fans won't tolerate those type of changes to Wonder Woman. So DC Comics is afraid of the fans? Why would they be afraid of the Wonder Woman fans more than any other fan group? Fans are fans. 4. Gal Godot has already been cast as Wonder Woman and she has signed on for three films, including 'Superman versus Batman,' a separate Wonder Woman film, and a 'Justice League' film. Yes, this is true. Gadot has signed on as Wonder Woman, but the only film that has been greenlit has been the 'Superman/Batman' project. So Wonder Woman's debut will be as 3rd wheel to Superman and Batman in a Zach Synder ('Sucker Punch') film no less. And then there's still no guarantee that she will get her own films afterward. 5. Most of the comic book fans are male, so they have to appease the male comic book fans. Yes, it's true that most comic book fans are male, but there was recently an article on i09 that the fans don't make or break a film. Fans are responsible for the film's legacy or how the film is perceived, not the film's box office success. Also, I know plenty of male fans who love Wonder Woman and who would watch her on the big or small screens. This problem isn't exclusive to DC Comics. Marvel's 'Black Widow' was supposed to get her own film, but now Marvel is backsliding...big...time. Yes, we get it, female superheroes are in ensemble films, but when will a female superhero carry her own film again? The last one I recall was 'Catwoman,' which admittedly was disastrous, but not because it was female-led, but because it was a terrible movie. Halle Berry's ripped pleather Catwoman outfit didn't help matters. Rant over. Until the next time. Amy Acker returns to Whedonverse as Agent Colson's love interest in 'Agents of Shield.' Remember the cellist Colson talked about in 'The Avengers?' Yeah, I guess that's her. Yay for Amy. Photos of the Scarlett Witch and Quicksilver from 'Avengers 2' have surfaced. Elizabeth Olson looks fantabulous. Ready for some 'Sleepy Hollow' Season 2 spoilers? Here ya go. So supposedly 'The Walking Dead' spinoff is definitely happening. Sigh. Really? It's not like this is a 'Law and Order' franchise or something. The Rock will play Hercules in a live action film. Actually I think this is pretty good casting. He fits the part. This one is for the book lover in your life. 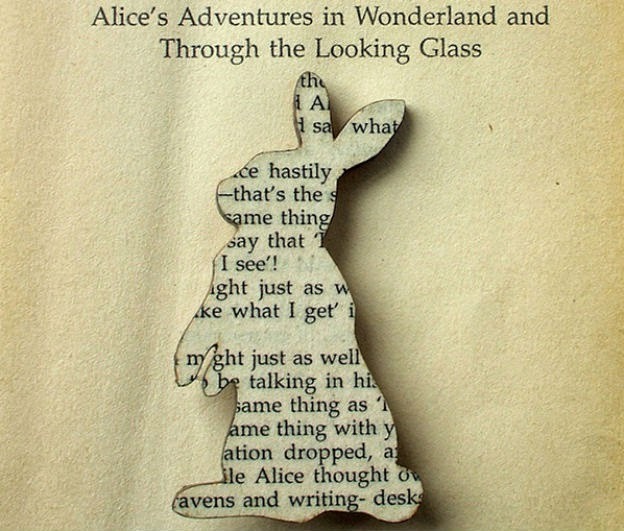 You can buy a brooch made from classic literary works, like 'Sherlock Holmes,' 'Pride and Prejudice,' and 'Alice in Wonderland,' etc. 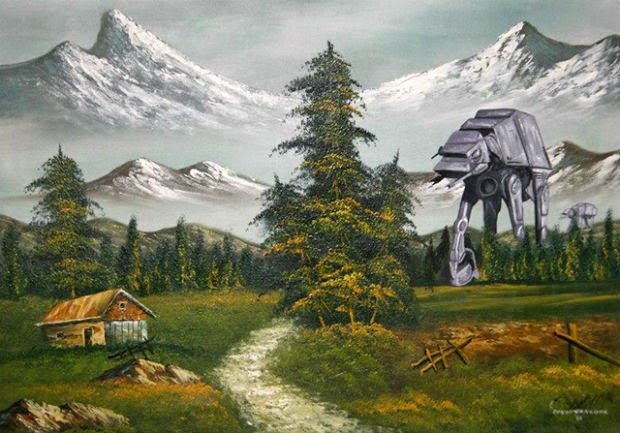 Artist Dave Vancook adds a 'Star Wars' flair to thrift store paintings. Very cool. I have a few paintings he can touch up. Do you like to bake? Why not try baking a scientifically accurate version of the planets? You will be the King or Queen of any bake sale. Take the CakeCrumb Tutorial. Do you want to learn Dothraki? I do. 'The Grudge' is being rebooted. Come on folks, can't you wait at least 10 years to reboot a series? The original 'Grudge' came out in 2004 and admittedly it was a successful little horror flick, unlike the two follow-up sequels. Yes, there was a 'Grudge 3.' No, I don't remember it either. The original Japanese film it was based on, 'Ju-On' came out in 2002. Screenwriter Jeff Buhler (Midnight Meat Train) is rewriting. I will withhold my judgment, but I'm skeptical, especially considering he wrote 'Midnight Meat Train.' At least the first film was produced by Sam Raimi and Rob Tapert. I'm not sure what the reboot has going for it? New trailer for 'Dawn of the Planet of the Apes' looks pretty good. It's more of a teaser trailer, but you get the gist of it. The apes have taken over and it's on. Us humans are in trouble. New Trailer for 'Jupiter Ascending' with Mila Kunis is out. I can never tell how a Wachowski film will turn out. 'The Matrix' was great. 'Matrix 2' and 3 were not. 'Cloud Atlas' was both hit and miss. Hopefully 'Jupiter Ascending' will make sense (and be good). When it comes to the Wachowski brothers - sorry, they were brothers - anyway, it is hit or miss now. I did not like Cloud Atlas at all. Apes - if it's as good as the last one, should be epic. And the House of Thrones mashup - awesome! Hi Alex! Yes, I just say the Wachowskis and I figure people know who I'm talking about. I don't want to offend anyone. I actually enjoyed 'Cloud Atlas,' but it could have been so much better. I think that was part of the problem they had such great material to work with and they didn't use it to its full potential. I thought Hugh Jackman was great. I am looking fwd to the new ape movie. If Andy Serkis is involved it will indeed be epic. Yes, thanks. I think I'm beating a dead horse on WW, but I love Wonder Woman so much! Oops I mean Hugh Grant! Not Hugh Jackman. HA! The Walking Dead Law and Order! I'd pay to see that! I hope that Gal Godot does well in the part. She is Israeli and was in the israeli military so she should have a definite advantage in fighting style. David what a great idea! See you should be a television producer. I think Gal will do fine. I'm actually looking fwd to her. Although she wasn't my first choice. LOVE Thrones videos here, so much fun! This whole superhero films business is honestly so sexist. I usually don't rant about things like this, but they are just blatant about this stuff- there are so many incredible female characters in Marvel and DC with Wonder Woman being practically iconic and they still don't have the balls to do stand alone movie. Sati- I think you hit the nail on the head. They don't want to take the chance on it. I love these Thrones videos. I'm so excited about Sunday. I'm with Sati on the superhero thing bring pretty sexist. Just because Catwoman bombed doesn't mean everyone else will. There's SO many interesting female characters in the Marvel/DC universes. Absolutely, it's like the comic book writers are way ahead of hollywood. Go figure. I think (non-romantic) female-led films have a hard sell in hollywood period. Even non-superhero female films. I recently read that most movie goers are female so they need to start changing the dynamics!